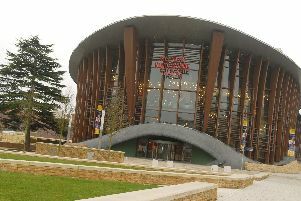 A whole bunch of favourites from Strictly Come Dancing will feature in the new season of entertainment at Aylesbury’s Waterside Theatre. Professionals Vincent Simone, Flavia Cacace, Natalie Lowe, Joanne Clifton as well as winners Jay McGuinness and Louis Smith feature. Vincent and Flavia perform Tango Moderno while Jay, Natalie and Louis appear in Rip It Up mixing different styles of music with energetic dances. Reigning champion Joanne appears in Flashdance the Musical alongside A1’s Ben Adams. There will be thrills and spills from former Eastenders actors Paul Bradley and Jessie Wallace in Deathrap, one of the longest running shows in Broadway. For those looking for something a little lighter, the comedy musical Hairspray is performed at the theatre while All or Nothing - The Mod Musical can be seen later in the year. There will be plenty of theatre for all the family as The Railway Children and Peppa Pig come to the venue to delight all ages. There is also the stage adaptation of the book The Tiger Who Came To Tea and pantomime Snow White and the Seven Dwarfs starring Su Pollard and returning from last year are Andy Collins and La Voix. Other hightlights include comedians John Bishop, Jasper Carrott, Jon Richardson, Joel Dommett and Rob Brydon and musical tributes to Kenny Rogers and Dolly Parton in Islands in the Stream. Other musical tributes include The Illegal Eagles and the Johnny Cash Roadshow. La Voix, The Dreamboys and Nina Conti will also return to the stage, the first of these in an adult only show ahead of her pantomime appearance. Tickets for all of these shows and many more are on sale now. For further information or to book tickets in advance call the box office on 0844 871 7607 or visit www.atgtickets.co.uk/aylesbury.